Mohanlal and Amala Paul will team up in director Joshiy's Run Baby Run, which will hit the cinemas on Thiru Onam day (August 29). Produced by Milan Jaleel under the banner of Galaxy films and scripted by Sachi (of the erstwhile Sachi-Sethu duo who wrote Chocolate, Robin Hood and Seniors), the film has the world if the media as the backdrop. 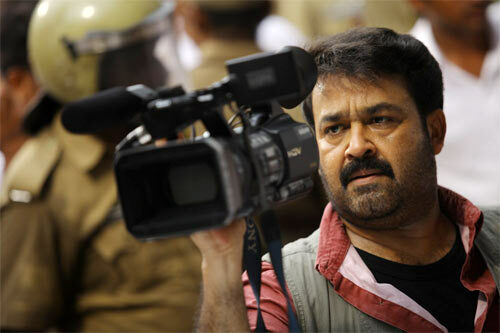 Venu (Mohanlal) is a high profile news cameraman. He graduated from a premier film institute but preferred to shoot news rather than the manipulated visuals for movies. Every big name in the trade tries to woo him. He is mostly based in Delhi but has come to Kochi now. Renuka (Amala Paul) is the executive editor of a news channel. She is bold and efficient. She has shifted from another channel recently to launch a new one and has been doing very well. Venu and Renuka have known each other for long but were not the best of friends. The two come together to investigate a particular story. Rishikesh (Biju Menon) is another channel head, who is going through some difficult times, as some of his star performers have gone in search of greener pastures. Sachi, the script writer says, "Run Baby Run has lots of thrilling moments, but it can't be called a thriller as per the conventional equations. "It is not just about the media, though the protagonists are media persons. I got the basic storyline while watching an Iranian film during a film festival. Of course, there is no connection with that film, other than one of the lines that I read from the sub-titles which continued to haunt me." Amala Paul, who started her career as an actor in Malayalam films in a brief role in Neelathamara, went on to become quite a sensation in Tamil and Telugu films. She is back in Malayalam in this high profile film. The Mynaa girl is all excited about the project with Mohanlal. She was recently seen in the Malayalam film Akashathinte Niram. Run Baby Run has cinematography by R D Rajasekhar and music by Ratheesh Vegha.